thePEOPLE are honored to be included as part of THE NEW PARISH 10 YEAR ANNIVERSARY LINEUP! We love you, New Parish! Thanks for giving us a home and CHEERS to a SOLID DECADE of music in Oakland!!!!! 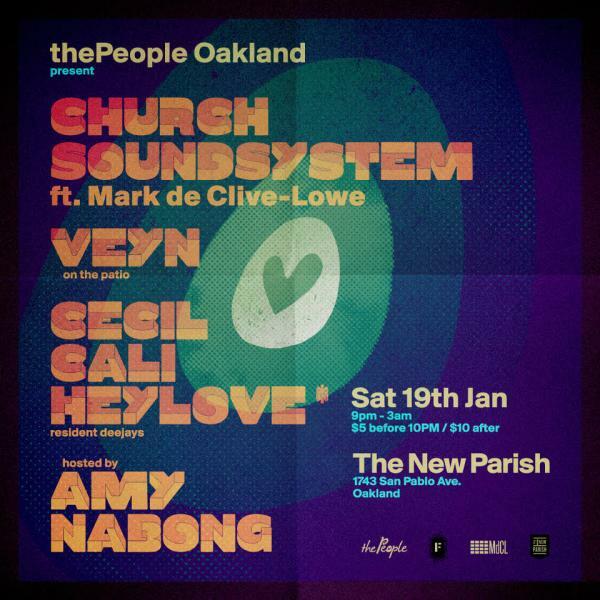 In honor of this momentous occasion, we bring you CHURCH SoundSystem LIVE! Mark will be dropping a very special -on-the-fly- REMIX dance session for thePEOPLE! Super soulful vibes on the way, from one of our MOST favorite artists in the world. It that wasn’t enough, we’ve got VEYN bringing his Virgin Island vibes to the patio, allllll goodness! THIS is how you celebrate 10! Let’s go PEOPLE! The New Parish | 1743 San Pablo Ave.